The changing season may not be as evident here in San Francisco as other parts of the US, but leaves are turning, darkness arrives earlier every day and there is new autumnal fruit and vegetables at the local farmer’s market. Blushing apples, pears, pumpkins and squash. Leading up to Halloween the pumpkins started taking over- pumpkins in piles at the market, in window displays, carved or whole on doorsteps. Pumpkin spiced everything appeared on menus, as well as in coffees and other places pumpkins don’t belong. But it made me start thinking of ways I like to eat pumpkin and decided to have a few friends over for dinner to celebrate pumpkins and the arrival of autumn. I bought four different pumpkins and squash at the market to see what they were all like and made two meals out of them. (I love it when you can prep once, eat twice- speaking of which, my favourite blogger has just done a series for The Guardian which is about exactly this. She is an English woman living in Rome and her recipes are so fantastically Roman. I love them and whole heartedly recommend the braised lentils two ways.) Anyway, from these pumpkins I made ravioli di zucca for the autumn dinner with friends and then a spicy Thai pumpkin soup for Ollie and I to have on the Sunday night. PLUS I put the off cuts from the pasta in the freezer and we had these with a beef sugo a week later. Peel, seed, cut into cubes and roast the pumpkin at 180 for about 40 minutes or until it is well cooked. While this is cooking, finely dice the onion and garlic and fry in plenty of butter until very tender. When the pumpkin is ready, add it to the onion and garlic with the grated nutmeg, finely chopped sage leaves, cream and a good seasoning of salt and pepper. Mush it up with a fork so you have a smooth filling with all the flavours combined. Now start with your pasta dough- you just need 1 cup of flour and 1 egg per person. Make a well in the centre of the flour and add the eggs. Whisk the eggs with a fork, and when they are mixed, slowly bring in the flour until you have a dough. Now you can take out and unwanted anger on the dough as you knead it for at least five minutes. You’re aiming for a smooth and silky consistency. Cover with flour, glad wrap and leave in the fridge for half an hour. This now gives you time to realise that your guests are due to arrive, quickly clean up the apartment, open a bottle of wine, and pretend that it was your intention all along to be rolling out pasta when they arrive rather than be organised beforehand. 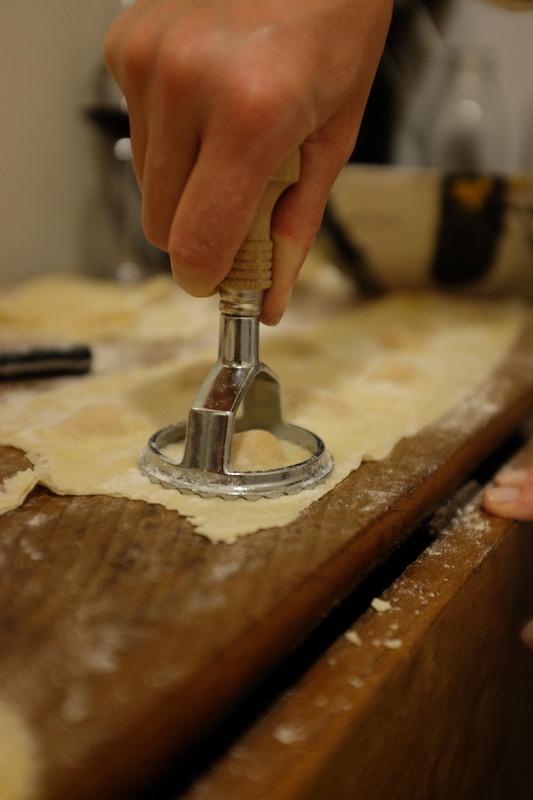 Making pasta is best when you have two people involved, one to do the rolling and one to do the ravioli making. 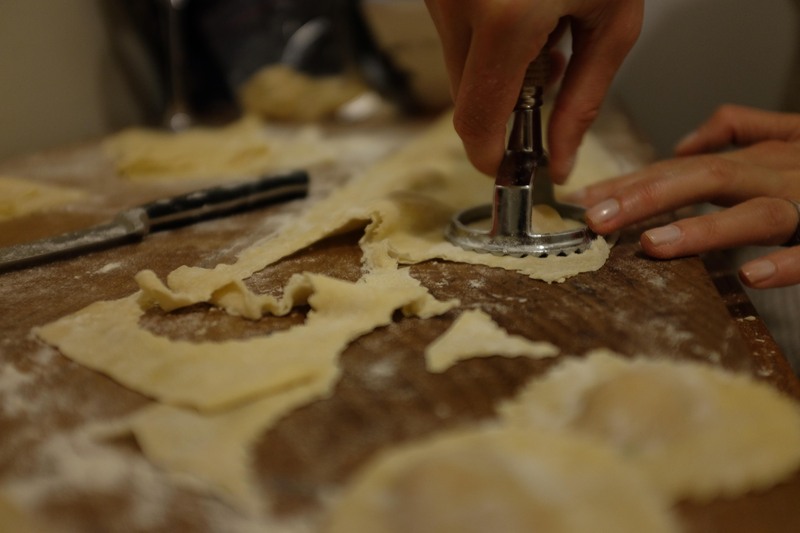 The roller wants to work the dough through the machine down to the smallest setting, making sure the pasta is well dusted so it is easy to manipulate and doesn’t stick. The ravioli maker wants to put about a teaspoon of mixture evenly spaced down half of a sheet of pasta- you should be able to fit two across. Then fold the other half over top and tuck the little pumpkins into bed, pressing down so that all the mixture is sealed in. You can now cut them with a knife or use a ravioli or cookie cutter to make them into ravioli. 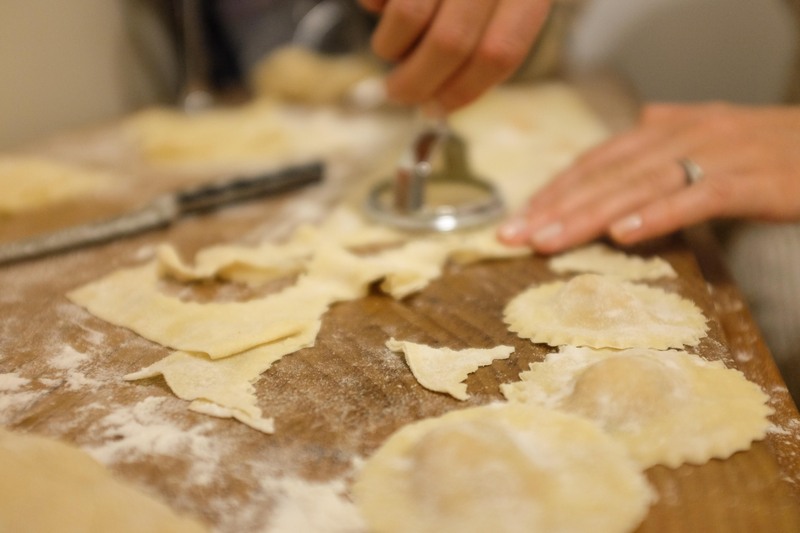 Keep on doing this until you have used all your pasta and you have a plate of beautifully dusted ravioli ready to cook. The dusting part is really important, there is nothing more frustrating than all your hard work sticking together. These will only need 4-5 minutes in boiling, salted water to cook. While they are doing this, melt down a big hunk of butter and fry the remaining sage leaves until they are nice and crispy. Drain the ravioili, plate up and pour over the burnt sage butter. Buon apetito! Coat the bottom of a heavy bottomed pot with plenty of oil and add the spices so that you have a delicious paste to start your soup. Add the roughly chopped onion, garlic, carrot and celery and cook on a gentle heat for about 15 minutes. Add the pumpkin coconut milk and stock and simmer for at least 15 minutes to combine the different flavours and textures. Use a mixing stick to blend it all together, or if you don’t have one, transfer to a blender. It is up to your personal preference whether you like to keep this chunky or blend until it is smooth. Simmer for ten minutes longer to make sure they flavours have all mingled together in a delicious way and then serve in deep bowls with fresh coriander (and natural yoghurt should you wish) and toasted bread or naan breads. 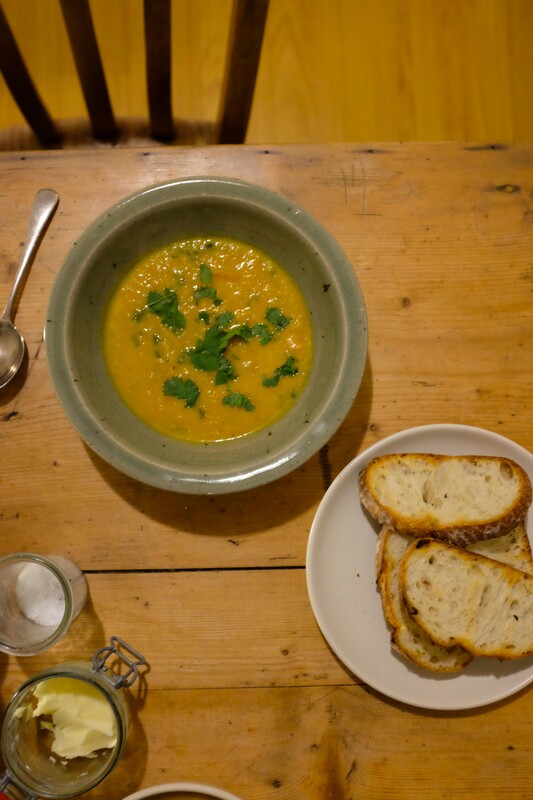 A perfect Sunday night dinner for when it is cold outside. Happy fall y’all.